I was interested in the theme of Josef Ansorge's 'Spirits of War: A Field Manual' (2010, International Political Sociology) which suggested that field manuals represent the (only) method through which military doctrine is 'disseminated and communicated'. Field manuals have been a central debate to military doctrine since the release (December 15, 2006) of FM 3-24. The manual had "1.5 million downloads in the first month", now represents a central COIN work and arouses controversy as a piece of anthropology (the Ansorge piece chronicles the debate well and has excellent sources, but see also here and here). But I was also interested in the general literature that 'warfighters' read. In a number of my interviews with serving military personnel, field manuals represent the 'classroom texts' whilst outside of the lesson, these soldiers have a number of favoured books that seem to amply represent their concerns. 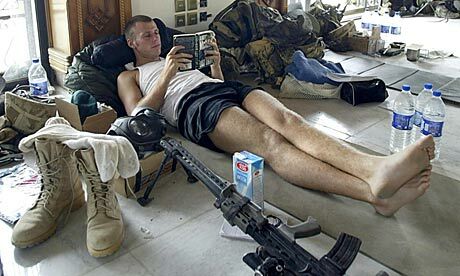 Thus below is just a very few 'favourite' reads of some 'warfighters'. I'd welcome more. In his preface to Book of a Mujahideen, Basayev notes that he obtained the Brazilian self-help guru and spiritualist Paulo Coehlo's 'Warrior the Light: A Manual' to derive benefits for his mujahideen. Who is the Warrior of Light? Any of us, reaching out to be the fullest person we can be, not afraid to have doubts and fears and to make mistakes and to learn from them. "That is why he is a warrior of light, because he has been through all this and yet has never lost hope of being better than he is." It is a path of tolerance: "In order to have faith in his own path, he does not need to prove that someone else's path is wrong." It is a path of intuition: "the warrior knows that intuition is God's alphabet and he continues listening to the wind and talking to the stars." If we are met with the same problems and situations over and over again, instead of becoming depressed we should learn: "Yes, you have been through all this before," replies his heart. "But you have never been beyond it." Then the warrior realises that these repeated experiences have but one aim: to teach him what he does not want to learn. Collected from Coelho's newspaper columns in the mid-90s, these short passages are not always easy or comfortable; but maybe that's because life isn't either. This is a book for dipping into for spiritual refreshment and sustenance. "This article misses the point of the IDF’s engagement with Deleuze and Guattari: the problem is that the IDF takes on the role of the war machine as well as that of the state. On one level, Israeli state forces relentlessly striate Palestinian space, imposing a system of controls that severely limit population movement and behaviour. With their roadblocks, checkpoints, Israeli-only roads, curfews, control of water sources and closure of borders, the Israeli state tries to limit Palestinian movement to zero. (ICHAD is very good on this and provides a number of detailed maps). At the same time, the IDF has learned from Thousand Plateaus the value of smooth space; the IDF becomes a war machine. Deleuze and Guattari say “make the world Swiss cheese,” and the IDF moves through a city by blowing holes in walls. They do not move down the roads, they create a new route through buildings: the war machine erupts into a Palestinian living room. Deleuze and Guattari acknowledged that this could happen: an insurgent inhabits smooth space, but so does globalised capital and all the violent apparatuses in its service." Catapulted into the popular Western domain by Brinjar Lia's 'Architect of Global Jihad', and by the $5 million bounty placed on his head by President Bush (before he was captured by Pakistani security agents in Quetta in October 2005 and handed over to the CIA - his whereabouts, in US custody, are currently unknown). Al-Suri has been variously described as being being 'the Francis Fukuyama of al-Qaida' (Newsweek) and the 'most dangerous terrorist you've never heard of' (CNN). He is 'provocatively at home with infidel sources, more likely to quote Mao than Mohammed' and well known for giving lectures on Robert Taber's 1965 classic study of guerrilla movements, The War of the Flea (once a favourite of the IRA). He is the author of the 1600-page 'The Global Islamic Resistance Call'. Tillman was rapidly ascending to an iconic status within the American post-9.11 landscape, having given up his multi million dollar contract with the Arizona Cardinals to enlist as an Army Ranger. Tillman was killed in Afghanistan in 2004, in an incident which is now believed to have been a blue-on-blue event after a firefight with Taliban. In a Sports Illustrated article from 2006, "who else," writes Smith in the article, "in the NFL or the U.S. Army took a book everywhere, even on 10-minute errands, read The Communist Manifesto, Mein Kampf, the Bible and the Koran, so he could carve out his own convictions ... then bought you the book and picked a philosophical fight just to flush out some viewpoint that might push him to revise his, push him to evolve?" You can't have fun in between the fighting? His now infamous email exchange with Leah Farrall was a masterclass. Sun Tzu wrote that it is imperative to, 'know the enemy, know thyself...' Which goes some way to explaining the fascination with the reading material that is discovered in the insurgent strongholds. The other reason may be that as Barkawi noted, military history has been an almost entirely Western enterprise (2004, 'Globalization and War'). The Taliban and Pakistani Taliban have very different strategic perspectives (regional) from the global jihad that al-Qaeda purports to wage, but the groups tend to get lumped together when evaluating their texts found in Afghanistan/NWFP houses. William Lind's 1989 4GW article was unfashionable within American military doctrinal thought until an Arabic translation was posted to a militant website with ensuing discussion (see Thomas X. Hammes, "Fourth Generation Warfare Evolves, Fifth Emerges", Military Review, 2007). Leftist Revolutionary Manuals predominate in the training camps, which augments Olivier Roy's claim that al-Qaeda is the heir to Marxist revolutionaries. Porter notes (2009, Military Orientalism) that Winds of War has been found in at least one training camp, and insurgents are fond of quoting Mao's 'three stage' concept of guerrilla struggle. Which may explain where al-Qaeda are going wrong, because a global jihad survives by assistance from outside, not among the people. "During the Cuban Missile Crisis, President Kennedy read Barbara Tuchman's "August 1914". 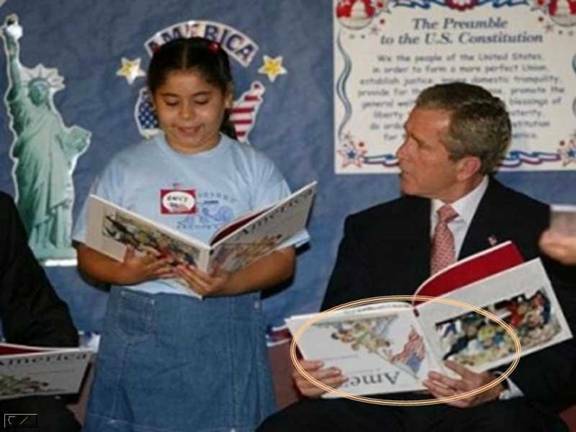 As President George W. Bush prepares for a second Gulf war, he apparently is reading Eliot Cohen's Supreme Command. Kennedy would have had more fun. Tuchman is a better read than Cohen. She also advances what proved in the circumstances to be important advice: leave the subordinates to deal with the telegrams while the boss keeps a clear head to decide for peace or war. Curiously, the episode itself produced a book still eminently valuable to a statesman in crisis, Robert Kennedy's Thirteen Days. It tells how Bobby, as chairman of the Executive Committee, spared his brother Jack the confusions that helped to drive Europe into the first world war." "This is not a book about the decline of America, but rather about the rise of everyone else." So begins Fareed Zakaria's important new work on the era we are now entering. Following on the success of his best-selling The Future of Freedom, Zakaria describes with equal prescience a world in which the United States will no longer dominate the global economy, orchestrate geopolitics, or overwhelm cultures. He sees the "rise of the rest"—the growth of countries like China, India, Brazil, Russia, and many others—as the great story of our time, and one that will reshape the world." See also Joseph Nye's new work, "The Future of Power" about relative and absolute decline of American in the 21st century and his great conceptual model, Soft Power. In 2003, a scheme was implemented to make British families and the serving member of the family read the same book so that it would form a 'bridge' of shared experience and ease deployment stress. It's probably not hyperbole to say that the US military is in something of a spirito-strategic quagmire, vainly clawing out for holy grails that would show how to reorient its forces effectively to face this post-Cold War landscape in which it has proved so ineffective. Of the many debates that have surface, the one about Greg Mortenson's 2006 book "Three Cups of Tea" is surely one of the more bizarre. The book is not martial in context, relating the author's account of his failed ascent of K2 and his subsequent work in the nearby Pakistani villages and his building of schools there. But his intimate knowledge of the 'human terrain' there made him a celebrity expert amongst US counterinsurgency experts and propogated the COIN 'tea culture'. Recently, the vast majority of the book's veracity has bbeen called into question, suggesting a desparation amongst the highest eschelons of US military for a Moses type figure to lead them to the promised land (further here and here). Finally, the power of a well-placed recommendation can work wonders for sales. When Buffett suggested to a Dutch financier the 'obscure' book on the Weimar Republic by Adam Fergusson, one time advisor to the Tory minister Lord Howe, published in 1975, sales hit the roof, copies changing hands for as much as £1600. The book, 'When Money Dies: The Nightmare of the Weimer Hyper-Inflation' has since been reprinted. Another book of note is Adam Tooze's 'The Wages of Destruction: The Making and Breaking of the Nazi Economy'. Any other warrior reading comments, most welcome.